Fireye offers a number of Series 9000 Flame Amplifiers for use with the Series 9000 Flame Scanners. Each flame amplifier provides a flame relay, marginal alarm relay, adjustable flame threshold, adjustable flame failure response time (FFRT), built-in flame meter, 0-10 VDC output for a remote flame meter, and two separate adjustable gain settings selectable via external contacts. R9105P5002 Rack mounted flame amplifier with selectable jumpers. DE4643-001 4-20ma output module for use with R9005P, R9105P, R9107A. Q9105 Rack (Enables replacement of R9001M amplifier). Q9801C1124 8 Position mounting rack for R9105, R9108 , R9107. Q9801C1126 8 Position mounting rack (with jumpers) for R9105, R9108, R9107. 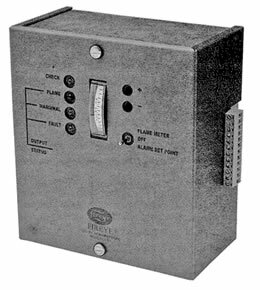 000160-001 0-10 VDC flame signal meter. 003181-001 K1 relay for R9001M flame amplifier. 003183-001 K3 relay for R9001M flame amplifier. 101363-002 Replacement fuse for R9005P, R9107A flame amplifier.